The Wall Paintings Workshop has carried out conservation work to a number of 13th century schemes including those at Bledlow and Lacock Abbey. Protection and conservation of the delightful 13th century paintings in a niche at Wisborough Green, Sussex, was carried out during redecoration of the interior.The removal of a darkened wax coating was carried out on a 13th century masonry pattern scheme at Bledlow, Bedfordshire, and similar paintings, including a St Christopher and Crucifixion scene, were conserved in the Chaplains Room at Lacock Abbey, Somerset, for the National Trust. 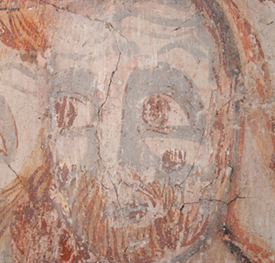 Wall painting surveys have included the assessment of wall paintings at Cleeve Abbey for English Heritage.